While there are thousands of magazines published every month, they are not all worth your money and time. Of course, majority of magazines belongs to a specific genre and often you care for the ones in your area of interest. However the magazine falling in “general interest” have more readership as they contain valuable stuff (ideally) for almost everyone. We love reading Safari – a knowledge magazine from India; as almost each and every issue of it is worth the money and time you spend to read it. The magazine is running since many years. In fact they have started English edition of Safari which eventually couldn’t survive after running successfully for some time (Safari – January 2015 – English edition). It’s Gujarati edition runs smoothly and have good reader’s base. On a side note, the publication house itself have seen three generations of remarkable writers of the same family. Vijaygupta Maurya (pen name of Vijayshankar Morarji Vasu) have started writing articles about scientific stuffs. His articles were full of knowledge and his writing style was very interesting. He wrote with many pen names. You can follow this article to read more about him. His son Nagendra Vijay continued the legacy effectively. He is blessed with the same interesting writing style. Nagendra Vijay’s son Harshal Pushkarna runs the publication house now. Of course Nagendra Vijay is still active and contributes in each issue of the magazine. These 3 fellows from different generation gives us a good example of what the word “legacy” means and how it should be carried forward. 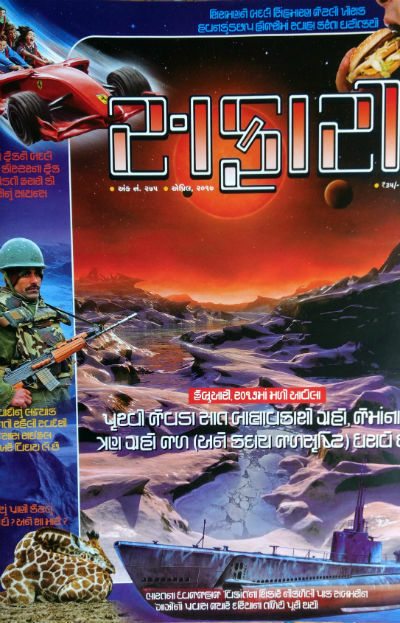 Anyway, we can talk about their contribution to the field of literature some other time, but today let us discuss about the April 2017 issue of Safari Magazine (Gujarati Edition). The issue is out in the market quite on time and we have completed reading it a couple of days ago. Here are out personal unbiased views and reviews for the same. Let us start with the cover page of the issue, as it is going to make the first impression on the reader’s (or potential reader’s) mind – for the issue, even before reading it. The cover page uses cheerful colors (and more focused on dark red, brown, black, white colors precisely), making it attractive and decent at the same time. It creates the impression of a no-nonsense magazine with valuable articles. This issue’s editorial is quite interesting. The editor talks about his meeting with Bana Singh a soldier (Subedar Major and Honorary Captain) of Indian Army. Bana Singh is very respected in army and civilian both the circles and he was awarded Param Vir Chakra (the highest gallantry award in Indian Armed Forces) for the display of ultimate bravery in adverse condition. He was also the one who led (as Naib Subedar) a team to conquer the highest peak in Siachen (during Operation Rajiv). It is worth to note that the peak was named as “Bana Post” in his honour. Meeting such a remarkable soldier (now retired) is definitely one of the best moments of the editor’s life. I would also like to point out the message reflected in the last lines of a small article about various largest statues around the world. It is all about humanity and people. It is an irony that we often got to know much about some remarkable historical incidents only after they came to limelight due to it’s portrayal on silver screen. Some movies does a remarkable job to talk about such incidents. The list includes (but not limited to) Airlift, Gaur Hari Dastaan, Khele Hum Jee Jaan Se, and many more. (Many of the biopics like Bhaag Milkha Bhaag, Mary Kom, Paan Singh Tomar, Neerja,… draws our interest in some real life heroes.) Adding to the list is one of the recently released Hindi film, The Ghazi Attack. While movie makers have their own way to portray the incidents, the movie is definitely a good watch. The incident was kept secrets for years, and the reason of the destruction of Pakistan’s submarine PNS Ghazi is still disputed; there is no way to explore it with 100% authenticity. There is a detailed article written by ace author Nagendra Vijay in this issue about how PNS Ghazi was sent to hunt for INS Vikrant. In addition it talks about how armed forces of India (that is Bharat) have acted-reacted wisely and INS Rajput was sent to hunt for the hunter. It also talks about the role of American embassy (and spys) in the mission, in favor of Pakistan (which is not explored in the movie). The article is very detailed and still makes you want to know more about it. It is the success of the writer in that regards. It is worth to purchase the issue of the magazine just to read this single article. This 12 page article also contains some historical photos of remaining of submarine Ghazi. The idea behind making INSAS Rifle was to be self dependent for India in terms of combat weapons. The rifle have its pros and cons both. Now the government is taking a decision to make INSAS retired and go for some other better alternative of the same. There is a 6 page long article in this issue about INSAS rifle and whether it should be retired. The article is worth reading. D. N. Kaushik have wrote this article in interesting manner. Here is an external link we like you to visit to know more about this rifle. This is quite light reading article. Harshal Pushkarna have started this article with a real life incident happened in the office of the magazine itself. Then it goes ahead with the examples of some food challenges which seemed unachievable, but were achieved marginally. You can read the article in the light spirit only and you will enjoy. Another article which can be read in the spirit of light reading, but, actually contains some interesting information. It talks about the sleeping habits of successful people like Benjamin Franklin, Thomas Edison and Albert Einstein and then the focus goes to various animals including mammals and their sleeping habits and requirements. The article can give you the idea about the diversity the nature have implanted in various species to let them survive. In addition the regular segments and Q/A sections are there which makes the magazine a worth to go for option. Overall a really nice magazine issue which is worth to go for.